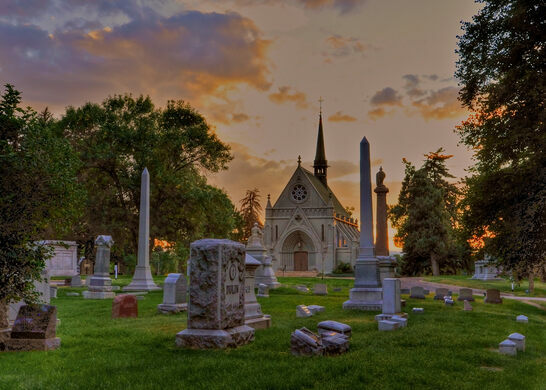 Join us for an in-depth tour of one of Denver's oldest and most beautiful cemeteries. Explore Fairmount's rich and fascinating past on an in-depth tour of the historic cemetery's grounds. At the time of its founding in 1890, Fairmount Cemetery's 280 acres represented the largest developed landscape west of the Mississippi. Destined to be grand from the start, Fairmount was designed by Reinhard Schuetze, whose success at Fairmount immediately became the talk of Denver. He subsequently designed City, Congress and Washington Parks, as well as the areas around the Capitol. Today, Schuetze is known as the father of Denver’s park system and Fairmount is home to Colorado’s most extensive arboretum, filled with numerous Champion Trees and one of the largest collections of Heritage Roses in North America. Highlights on our tour will include a visit to the cemetery's original Little Ivy Chapel, built in 1890 in the style of 13th-century French Gothic architecture, a grave walk showcasing a who's who of Colorado notables now permanently residing in Fairmount's Millionaires Row, an exclusive behind-the-scenes tour of the crematorium, and a chance to view the incredible stained glass collection of Fairmount's Community Mausoleum, home to more than 15,000 remains.